Probably! In this discussion, we will look at what researchers say about the subject. Spending time in a sauna makes you lose weight because of the water lost through sweating. This means that there is a change between your weight before getting in and getting out. This weight loss is temporary and you are bound to get it right back once you drink or eat something. Sweating is sometimes used to reduce weight temporarily by wrestlers and boxers so as to fit within specific weight category. Scientists say that exposure to heat in a sauna causes your heart to beat faster which requires more energy. To supply the extra energy, your body burns up to 20 percent more calories. While some cultures have used saunas as a way of detoxifying for hundreds of years, this practice is catching on in many places around the world. Sweating helps to detoxify your body because sweat contains lymphatic fluid which transports toxins through the lymphatic system. This means that perspiring eliminates toxins including heavy metals, thereby aiding your body to burn more fat since the toxins no longer hinder your metabolism. Therefore, while sauna weight loss is still under research, the resultant sweating helps to detox. Because exposure to excess heat causes your body to perspire excessively, you can dehydrate dangerously unless you keep replenishing by taking more fluid. Researchers say that when in a sauna, you can lose as much as a pint of fluid in a short while. To keep your body well hydrated, drink lots of water prior to getting in a sauna, when inside and once you get out. The heat in a sauna makes blood vessels to expand and get close to the surface of your skin. This improves blood circulation and lowers your blood pressure. Recent research associates regular use of saunas with better health of the heart. Still, if you have a heart problem, it is best to avoid the sauna. If you have hypertension, you can still use a sauna provided you don’t expose yourself to alternating temperature extremes as this may lead to elevated blood pressure. In case you are on medication, it is prudent to consult a doctor about the prospects of sauna weight loss. Don’t take drugs or alcohol when in a sauna as this may interfere with the body’s capacity to regulate internal heat and may lead to low blood pressure. When you first get into a sauna, spend no more than 20 minutes. You can build this up later once your body is acclimatized to the experience. Overexposure at the outset may be dangerous. You should also ensure that you are not alone during the first session in a sauna in case you need help. Take lots of water ahead of your session and keep seeping on more water through the session and after you get out. Avoid drinks like soda and juices which may pile more weight on you besides causing dehydration. Avoid or limit getting into the sauna in case you have a heart problem, you are expectant, have very high or very low blood pressure or you are older than 65. In all these cases, talk to a healthcare provider about it. Also keep children out of the sauna if not under supervision. When you step out of the sauna, let your body cool down slowly. Do not get out of the sauna and get into a cold shower as this will expose your heart to extreme stress. Remember that spending time in the sauna causes your heart to really workout. Therefore, avoid putting it under further stress. In case you experience chills, dizziness, headache, nausea or similar symptoms, while in the sauna, get out as soon as possible. Your body could be warning you about over-exertion. 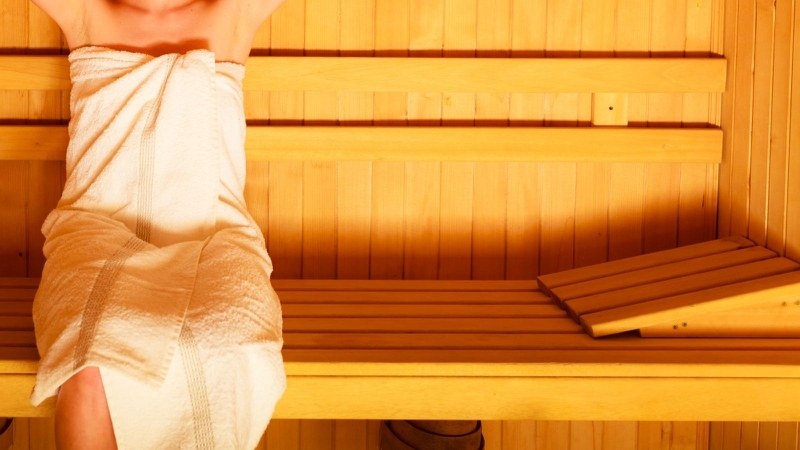 Is it possible to lose weight by sitting in the sauna? To some extent yes; and mostly temporarily! While it is okay to spend some time in a hot steam room, it is debatable whether or not this will lead to sauna weight loss. And while you may get some health benefits, there is little if any proof that this will help you lose any significant weight. And certainly, you will not build any muscles. Remember, in a sauna, the only muscle that works out is your heart. But real exercise will do a better job because it involves more muscles in your body and therefore increases metabolic rate and heat from the body’s own resources. Besides, when exercising, your body regulates its temperature more effectively. The whole process causes you to burn more calories unlike sitting in a room full of hot steam. In conclusion, having regular sessions in the sauna may be an enjoyable routine. It may even be part of an exercise routine, especially when it comes after a thorough workout. However, you are unlikely to lose real weight other than the water weight that you will regain as soon as you have a good drink of water. Probably within one or two hours! Server responsed at: 04/20/2019 12:36 a.m.